Holy cannoli. I'm still in book hangover mood trying to write this review, but here goes. I'd heard about this book for awhile, but I didn't really know what it was about. But then I saw the movie trailer (posted below) a few weeks ago and decided that I wanted to read it before seeing the movie later this year. I did see everyone's reactions to the trailer: "I'm gonna cry!!" That's all I knew. This book was intense. I don't want to say too much about the plot because I went into it not really knowing what it was going to be about and that, I think, made it a richer experience for me. But this book was definitely way heavier than I thought it would be. Not in a bad way. Definitely not in a bad way. I have a pretty solid stance on this issue, and this book made me consider the alternative. Will I do a 180 on my beliefs? Probably not. But it absolutely makes me understand and empathize. It gives me the reality of a different perspective and the worldview of those making the choice. I loved Lou. She is honest, passionate and compassionate. And I applaud her bizarre sense in fashion! Lou and Treena's relationship was lovely and honest. The Q&A in the back of the book touches on this, and Jojo explains how she finds the relationship between sisters mesmerizing: "What I'm most captivated by is that ability to be at each other's throats one moment and yet totally bonded and presenting a united front in the next." #truth, Jojo. The characters can be frustrating, but their lives are frustrating -- I'm looking at you Will and Camila Traynor! So you want to be cross with them, but you just can't. I absolutely encourage you to read this book. It will make you cry, as has been mentioned. But I loved that it made me question and expand my mind to be open to understanding the whys of something I can't fully understand. But it also made me smile -- a lot. It made me laugh. I was frustrated with the characters, then I felt sorry for them. Then I wanted to give everyone a hug. Basically -- the full range of feels. Question for you, if you're read Me Before You: the reviews for the sequel, After You, are not stunning. I know, and a lot of reviewers admit, that it can be hard to follow up something so great like Me Before You was. Have you read After You? 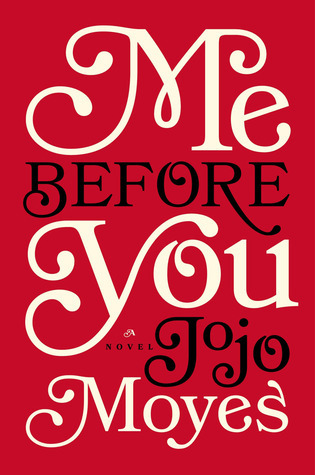 Knowing that I will probably not like it as much as Me Before You, is it still worth reading?